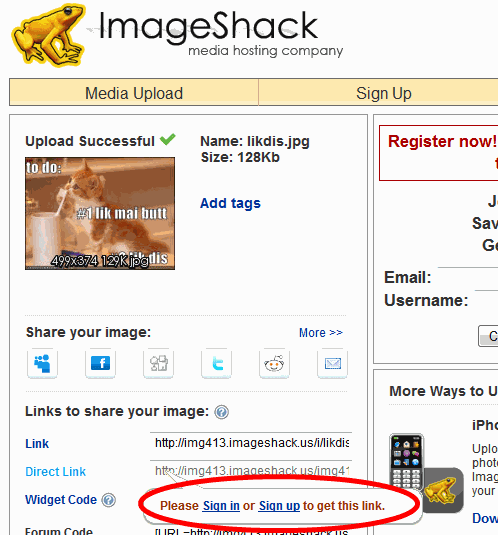 ImageShack is one of many free online image hosting services. Up until recently it's been one of my favorites because it allows you to easily copy a simple direct link to an image you've hosted. This allows you to link someone directly to a given image without any clutter, just the image by itself. As of a week or two ago, however, they've disabled their Direct Link textbox and insist that you register with their site for this privilege. Sure, you can still freely obtain the Link code, which will show the image plus some minimal markup of ImageShack itself, and you can still copy various forum, thumbnail, widget and other markup for the image you wish to host, but really, most often I just want the image alone, that's all, nothing else. I freely admit it, I am a cheapskate. There are several workarounds for this annoyance. 1. Upload an image to ImageShack as usual. 2. Right-click on the Upload Successful page and view source. 3. Copy the direct URL to your image, and paste it wherever you like. Why ImageShack chose to do this, I don't know. I've used their Direct Link for years, why they would choose to implement this, particularly when so many other image hosting sites like imgur continue to offer a plain URL to your hosted image, is a mystery to me. I'm certainly not enough of a die-hard fan of ImageShack that I would go to the trouble of digging into the HTML to grab that direct link each time, so I guess the easiest option is to just use another provider from here on out. Perhaps this will lead to a similar backlash to the infamous Gizmodo design change, which caused a significant reduction in visits to their site? Yet another example of how a seemingly small change to the user experience can prompt users to seek an alternative.